Can San Francisco’s integrated water policy unlock the market for onsite water? Cleantech investors have been stymied by the US water market. In 2015, water tech accounted for only 2.2% of cleantech funding, and 0.07% of the broader technology start-up market. While green building has driven the installations of renewable energy and new materials over the last decade, distributed water solutions have struggled to establish themselves in high-performance buildings. At the same time, US water utilities have piloted a host of promising technologies that treat water in buildings and tap into the energy potential within water infrastructure, but they have not succeeded in deploying at mass scale. After successfully piloting in here in the US, many of our best technologies have deserted home markets for Asia and Europe. Since 2012, San Francisco’s water program has brought three local agencies – the SFPUC, the San Francisco Department of Public Health, and the San Francisco Department of Building Inspection – to work together to develop a streamlined permitting process and regulatory framework. In 2013, the SFPUC expanded the program to allow buildings to share non-potable water across property lines. During the first two years of the program, twenty projects formally submitted water budget applications to the SFPUC. SFPUC has sought input from architects and engineers to examine how integrated design can achieve new levels of efficiency and build resilience in the face of severe storms and the earthquakes. These discussions have gone beyond the basics of installing water reclaim systems to look at synergies between water and energy management, public spaces and public health. Water is seldom seen in tUS buildings beyond the fountains at the entrance. The pipes that deliver water from remote centralized water systems are hidden. In installing its own onsite reclaim system for its new headquarters, the San Francisco Public Utility Commission (SFPUC) chose to showcase water treatment. In a recent presentation at the Aspen Global Change Institute, Kehoe spoke about the role of “process-focused and context-sensitive principles” in building resilient cities. San Francisco has a long history of trailblazing new kinds of legislation that have led national trends. In 1983, San Francisco made global news with the first mandatory requirements** for all workplaces to accommodate non-smokers. Yes, there was a trend toward limiting smoking in theaters and public places, but had the city gone too far? In retrospect, San Francisco was among the cities that pioneered a sea change in public policy around smoking. Within a decade, smoking bans outside of buildings as well as inside of them, became common throughout the US. Will distributed water systems also become ubiquitous in a few years? Green Building has redefined energy and materials in public buildings, but it has left water largely untouched. Urban sprawl and car-centric cities are rapidly being replaced by towns that integrate natural spaces and ecological corridors that bring people together and promote a sense of well-being. *Connor, Theresa. BLUEPRINT FOR ONSITE WATER SYSTEMS: A STEP-BY-STEP GUIDE FOR DEVELOPING A LOCAL PROGRAM TO MANAGE ONSITE WATER SYSTEMS. Publication. WERF, WRF, and the San Francisco Public Utilities Commission, 23 Sept. 2014. Web. 17 June 2016. As Hawaii’s cooling tradewinds have faltered and ocean temperatures rise, Hawaii’s leadership moved earlier this year to invest a significant chunk of its resources, more than $100M, to cooling its schools. Last year, temperatures sweltered above 100 degrees, and health concerns forced the Hawaii Department of Education (HIDOE) to consider suspending school for “heat days.” In Hawaii, the heat crisis in schools is shining a stark light on in-building heat as an obstacle to the State’s prosperity and economic survival. Only 6% of the state’s classrooms have air-conditioning, and Hawaii’s Department of Education (HIDOE) estimates that installing air conditioning in all classrooms would cost $1.7B and saddle schools with an even heavier burden of maintenance expenses. Image: PF Bentley/Civil Beat: Thermal image taken in a classroom at Hawaii’s Ilima Intermediate middle school, where midday temperatures measured 35.0 C or 95 Fahrenheit. Air conditioning has been one of the unheralded tools behind the success of other tropical economies, such as Singapore, and desert economies such as Israel, in the latter 20th Century. Economist Jeffrey Sachs quantified the impact that air conditioning has had in tropical economies on productivity by simulating temperate environments that enabled northern countries in Europe and North America to attain leadership during the 19th and 20th centuries. But as air conditioning helps Hawaii overcome one of the “curses of the tropics,” it carries a financial burden and makes their energy burden heavier. An analysis of schools with campus-wide AC compared with schools of similar size and relative location that do not have campus-wide AC indicates that the cost of electricity may increase by more than 80% in an air conditioned school. The HIDOE spends more than $62 million a year on electricity, gas, water, and sewage fees — a 50 percent increase over the past ten years. HIDOE estimates it will pay an electricity bill of $47.6 million this year.Worldwide power consumption for air conditioning alone is forecast to surge 33-fold by 2100 as developing world incomes rise and urbanization advances. Through a combination of energy efficiency measures, clean energy generation (including the HIDOE’s ongoing photovoltaic project, small-scale wind turbines, and other viable systems) and a comprehensive sustainability program, HIDOE is designing Ka Hei to improve the learning environment so students and teachers can perform at their best. Current options include passive cooling, which prevents heat from entering a building, and night thermal flushing to get rid of stored heat in a classroom overnight. Even when supplemental mechanical cooling is necessary, these concepts make conventional air conditioning (AC) systems more efficient. HIDOE has also been piloting new technologies that could reduce cost and be more sustainable. One of the most promising is photovoltaic (PV) air conditioning. A portable classroom at Waianae High is into its second year of running a pilot system using three PV panels for each AC unit. In the densely packed megacities of the future, warming climates and rising incomes will make cooling a decisive factor— for energy conservation and quality of life. By mid-century people will use more energy for cooling than heating. According to the Intergovernmental Panel on Climate Change (IPCC), energy demand for residential air conditioning in summer is projected to increase more than 30-fold by the end of the century: from nearly 300 terawatt-hours (TWh) in 2000 to about 4,000 TWh in 2050 and more than 10,000 TWh in 2100. On May 12, the District of Columbia Commission on Climate Change and Resiliency will consider adding a new renewable resource for cooling and heating– municipal sewers. The District of Columbia’s Renewable Portfolio Standard (RPS) requires District energy suppliers to obtain renewable energy credits (RECs) proportional to the energy they sell. If the new proposal is accepted, “Tier 1” renewable resources would include wastewater thermal energy along with solar, wind, biomass, landfill gas, wastewater treatment gas, and geothermal. Wastewater thermal energy (WWTE) systems transfer or absorb heat through the conductive piping, from the wastewater to a working fluid in a closed loop. Regardless of above ground temperatures, sewage temperatures remain relatively constant year-round. These systems are completely sealed and odor-free, making them a safe and effective means of tapping into a sustainable energy source. WWTE replaces conventional HVAC systems, saving significant energy and fresh water. As cities struggle to scale up renewable energy sources and contend with unpredictable supply from solar and wind, WWTE systems provide a critical new resource for renewable energy sources at peak periods. Regardless of whether the sun is shining and the wind is blowing, sewage flows match peak human activities. WWTE integrates component technologies that have been proven for decades. Both Huber’s ThermWin and International Wastewater’s SHARC system have been widely applied in Europe and Canada. ThermoWatt out of Budapest (Hungary) is one of many emerging companies offering robust WWTE solutions. These modular technologies are cost-efficient for buildings requiring at least 100 tons of cooling, and efficiencies build beyond that. WWTE requires nearby access to at least 100-150 gallons per minute of sewage flow. Given sufficient heating and cooling needs and access to sufficient sewage flow, WWTE can replace conventional HVAC for office buildings, hospitals, hotels and campuses. For example, at Marie Reed Elementary in Washington DC, engineering analysis estimates that Huber’s ThermWin WWTE-driven HVAC would save 364,692 kWhs of electricity, 24,508 Therms of natural gas and 4,480,000 gallons of water. At present, several US states, including DC, Massachusetts, and New York, are assessing the possibility of using wastewater energy recovery (WWER) as part of their efforts to replace fossil fuels with renewables. DC Water estimates that its sewage flow can generate 160-200 KW of energy. 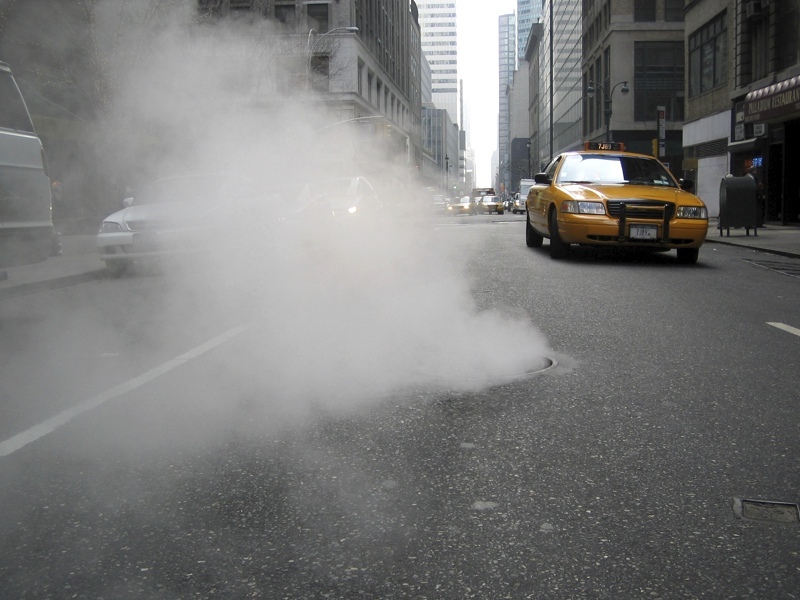 A study conducted in 2012 in New York City concluded that if 5°F of heat were removed from wastewater flowing through the sewer pipes beneath the streets over the course of 1 year, $90,000,000 worth of energy could be recovered. As US states like Hawaii and organizations like the US Navy and Apple aim toward high levels of renewable energy, WWTE will play a critical role in providing peak energy services. Some of the best known companies have their roots in tough times: Apple, Disney, GE and IBM all built their markets during economic downturns. “Scarcity forces a focus on developing creative ways to deliver customer value,” notes business expert Scott Anthony. Tough economic times force innovators to risk new approaches. Recent data suggests that the current slump in onshore natural gas drilling may be fostering a new wave of water tech giants. Even for an industry that has been defined by booms and busts, the current downturn in the oil and gas industry is the stuff of epic struggle. Deployment of operational rigs is the lowest since 2002, down 65% from a year ago in the sharpest collapse of US drilling in history. In its hour of reckoning, many producers and services companies are turning to water technologies to survive. Despite the downturn in the number of rigs, water usage has remained stable. Operators are focusing upon existing wells that produce more water, and using longer wellbores to extend their productivity. “Water represents 10%-30% of overall well capital expenses,” notes Piers Wells, CEO of Digital H20. “Water is becoming even more relevant in the current market environment where margins are being squeezed and there is an increasing emphasis upon operational efficiency and cost reduction.” In the face of the biggest collapse in history, “the energy sector to assess alternative sources of revenues, use of advanced technologies, and innovative practices,” notes Richard Seline, the CEO of H20 Accelerelate, a water tech accelerator in Texas. Water management provides cost savings that could determine survival. Companies like Gradiant are watching their sales grow during this extended collapse of drilling. CFO Luke Johnson notes: “We have seen a continued but more focused need for our water treatment services over the last 12 months. Customers are looking to reduce their LOE [lease operating expense] over their alternative procurement and disposal options.” According to Johnson, equipment and disposal cost savings were the primary driver for Gradiant’s recent 12,000 bpd recycling plant in the Permian Basin, commissioned just over a month ago. “We’re looking at a robust pipeline of opportunities in the US O&G market despite the macro-environment.” Johnson noted. Some of the most promising water tech companies are tuning their strategy to support lean drill pad operations. “The current oil price is impacting all O&G players, resulting in large reductions in their capital programs, and an increasing emphasis on operating efficiency and cost reduction,” notes John Coburn of XPV Capital. Filterboxx, one of XPV’s investments, has tuned its marketing strategy to “match their solutions to the changing needs of their customers, combining outright sales with equipment rental and turnkey operations services.” “This non-capital service offering provides customers with solutions to both their restricted capital reality and their high transportation and disposal costs – resilient water solutions, combining technology and economics.” Coburn explains. Could Data Centers Lead California’s Drought-Tech Future? Can data center technologies get some of the rebates that have been driving low-tech solutions for the drought? California prides itself on being the global hub for tech innovation, and it has been aiming to accelerate use of cutting-edge technology to face its historic drought. However, in the first year since California’s governor declared a state of emergency as a result of the drought, most of its cash has been spent on non-tech solutions. In Southern California alone, the Metropolitan Water District has quadrupled its budget to $450M this year for lawn turf replacement. So far, innovative start-ups aren’t applying advanced science and engineering, but rather spraying green paint to cover brown lawns. California’s programs are looking for ways to change basic practices to permanently replace big water uses. Turf replacement programs “lock-in permanent changes in water use by transforming to drought-tolerant landscapes that better fit our Mediterranean climate,” said Metropolitan board Chairman Randy Record, Chairman of Southern California’s Metropolitan Water District. As corporations in California face the drought crisis, new technologies for data center cooling offer an opportunity for them to migrate away from water-intensive cooling. Every new data center brings a thirsty customer. A midsize 15-megawatt center uses between 80 million and 130 million gallons of water a year for cooling, according to industry estimates “At the high end of that range, each new facility is akin to planting 100 acres of almond trees, adding three hospitals or opening more than two 18-hole golf courses,” notes Drew Fitzgerald of the Wall Street Journal. California has more than 800 data centers, the most of any state, according to an estimate by tech consultancy 451 Research LLC that excludes smaller computer rooms that businesses use. Based on that and estimates for water use, the state’s data centers consume roughly as much water in a year as 158,000 Olympic sized swimming pools. Even with their substantial growth over the last few years, data centers still use less than 1% of the water in California, as compared with 80% used by agriculture. At the same time, subsidizing migration away from water cooling data centers offers California a way to reduce water use right now, and save millions of gallons over the years to come.